Looking to take up tennis this year? 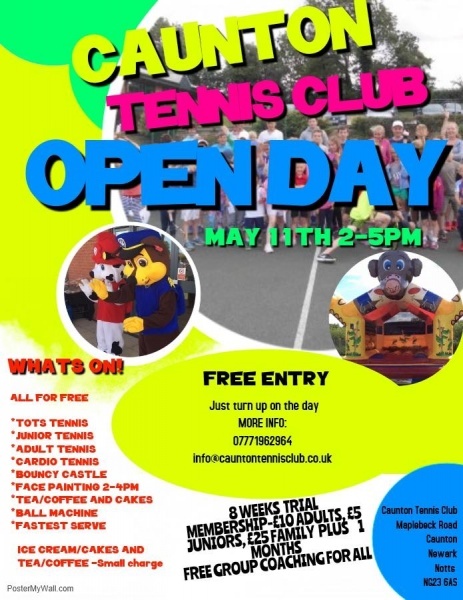 Why not come to Caunton Tennis Club’s Open Day on Saturday 11th May and find out more about this busy and vibrant club. Running from 2-5pm there will be tots, junior, cardio and adult tennis as well as a bouncy castle, face painting and other games and challenges for younger members. Refreshments will also be available. You can also sign up to the 8 weeks Trial on the day or maybe choose our membership offer priced £10 adults, £5 juniors or £25 for the whole family, which includes membership plus one month’s free group coaching.